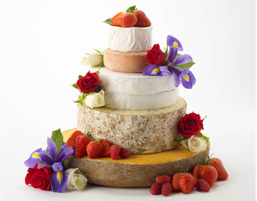 Our expert cheesemongers have now designed a range of Celebration Cakes to suit all occasions. We are also available to help you design a cake with all of your favourites to give it a more personal touch. We source all of our cheeses direct from small Artisan farmers so we can ensure that the cheese is of the very highest quality. We then carefully mature each cheese with great care and attention in our maturing cellars in each shop. Paxton & Whitfield have designed a selection of “off the peg” cakes - there is a cake available for all types and size of celebration, budget and personal taste. They can act as the main cake or as an additional cake to the traditional fruit cake. They can be used as a fourth course to the wedding dinner as well as on an evening buffet. Alternatively you may prefer to design your own cake using some of your favourite cheeses for the different layers. Our expert cheesemongers in the shops will be delighted to work with you to produce a unique cake to your specification. You will get a personal invitation into one of our shops to conduct a full tasting of the cheeses that you wish to include in your cake, or we can send out samples directly to you. Feedback from many happy customers indicates that a Paxton & Whitfield Cheese Cake made a great addition to their special day and was a winner with all their guests. What cheeses can we have? We stock over 150 Artisan cheeses in the shops so there is a wide range to suit all tastes. The harder cheeses form the base so they can support the rest of the cake, then a mixture of cheeses becoming gradually smaller make up the top of the cake. Please bear in mind that some cheeses are seasonal and they also have a different taste at different times of the year. Do you decorate the cakes? We have found that each couple has a different theme or colour scheme for the wedding and they tend to get the caterers or the florist to decorate the cake. What do we decorate the cake with? The cake looks stunning with some simple flowers that match the chosen wedding flowers. Fruits and nuts also work well. Our advice is to not crowd the cake with decorations, keep it simple. If you wish to have lots of fruit to compliment the cake then have them in a bowl on the side. Be careful of certain flowers as they may stain the cheese. What do we serve with the cake? The cake can be used on a buffet where people help themselves or the cheese can be served in platters or individual plates to each table. Ideal accompaniments are baskets of fresh breads, a variety of biscuits, fresh fruit, fruit preserves, honey and nuts. Also dessert wines and port compliment the cheese. We can recommend accompaniments to suit your selected cheese. What do we present the cake on? The cake should sit on a wide cake stand or board. The base can range from a traditional board to a segment of wood. Each tier can also be separated by boards or cake columns. We deliver to all areas of the British Isles. There is a £10 delivery charge. It is a next day delivery service to all areas of England and major cities. It is a two day delivery to the Highlands and Islands. We deliver Tuesday – Friday but if you prefer you can collect from our shops. We recommend that you take delivery a couple of days before the event. Where does the cake need to be stored? You will receive the cake in fully insulated boxes. On receipt, the cheese must be kept chilled. We recommend the cake is put together at least two hours before it is to be eaten to allow the cheese to reach its perfect eating conditions. How soon do I need to order the cake? As the cheese comes from small Artisan cheese makers it would be ideal for us to have the order finalised with as much time as possible. The very latest would be three weeks before the event to ensure the selected cheese is available and in peak condition.